Pallet racks can help increase storage density by using more vertical space instead of storing pallets on the ground. Pallet racking systems are most effective for storing large pallets of varying, medium-to-large goods. Plus, pallet racks can be easily adjusted to product mix changes by simply re-configuring the racks and using them with different products, saving money. Avoid dead zones (unused pallet rack storage) in the pallet rack by using the entirety of the pallet rack depth. Instead of lining a shelf with one SKU and having workers reach deep into the rack to grab the next SKU, use a carton flow system to load all the SKUs behind each other and let them flow forward to the order pickers on the slanted shelving. Not only will this help maximize space utilization in the warehouse or distribution center, it will help to make inventory easier to monitor and control while also reducing travel time and footpath between picks. To take less space, use high-density pick modules—multi-level storage units made from a combination of mezzanines, conveyors, carton flow racks, pallet racks, static racks and other equipment that delivers goods to pickers at each level. By stacking the racks, less space on the floor is taken while pickers can take less time to pick orders from the rack of SKUs that are close by and easy to reach. Multi-level pick modules use FIFO (first in, first out) stock rotation by using tilted shelves that use gravity flow to deliver containers of products or individual SKUs to the pick face. With FIFO, order pickers are presented with the product in the right order to be picked; this is particularly useful when items are stamped with an expiration date. If using carton flow in picking operations, cartons can be replenished from the back of the shelving while picking goes on at the front. Pickers can pick from open boxes or individual items on shelves. Pallet flow systems allow the pallet to flow forward once the items on the pallet have been picked. Conveyors can tie everything together in the picking operation by bringing items to the picker or transporting empty cartons and pallets away so they can be recycled. Forklifts can help to eliminate double-handling by loading full pallets on the rack, without having to put each individual case on the rack. This combination of material handling solutions allows DCs to shave valuable seconds off of each order picked, keeps pedestrian and forklift traffic in separate aisles for improved safety, and allows distributors to accommodate the ever-increasing demand for faster fulfillment in e-commerce channels. Make sure the warehouse space is consistent with items stored. A container of a particular size needs to be stored on a rack that accepts that size item, nothing less, in order to eliminate wasted space. Containers need to fit products as well so that the item stored fits securely within to avoid storing dead air and to reduce wasted space inside of the containers. Items within containers are often packaged with lightweight materials to protect the finished item. Packaging materials are typically chosen for their strength, weight and recyclability, but the packaging must be small enough to not take up too much space, but sufficient to protect the finished item. Packaging needs to be light also to keep shipping costs down. Using packaging that reduces the number of items that fit into a container affects space utilization and should be minimized. With products are constantly flowing in and out, managing an efficient product flow improves turn-around times so that customer delivery levels can easily be met. The flow through the warehouse depends on the size of the facility, number of dock doors, products handled and labor pool. 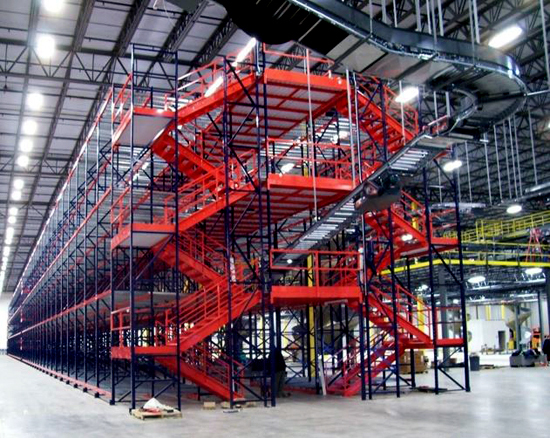 Regardless of the design of your warehouse, speeding fulfillment leads to more available space in the warehouse. While picking orders, a smooth flow of products and orders needs to be kept so that workers aren’t idle or products/orders aren’t piling up waiting to be filled. Slotting maximizes warehouse space by improving storage density, opening up hidden storage space within a facility. Inventory is slotted using a variety of strategies focused on speed/velocity of products, item storage (carton, pallet, individual SKU), seasonal usage, etc. Utilize high-density storage to minimize the footprint of slow-moving inventory and create more valuable space for your fast moving items. Workers will be able to pick fast-moving products quicker and easier in this format, helping to minimize footsteps while maximizing pick speeds. If products are picked down to the point where there are only a few remaining products, create smaller storage locations by re-slotting. Slotting also removes obsolete inventory which takes up much needed space, minimizing the amount of inventory carried. Additional space can often be found within a warehouse without having to lease additional space. Making these improvements will ensure enough space is available within the warehouse now and in the future.